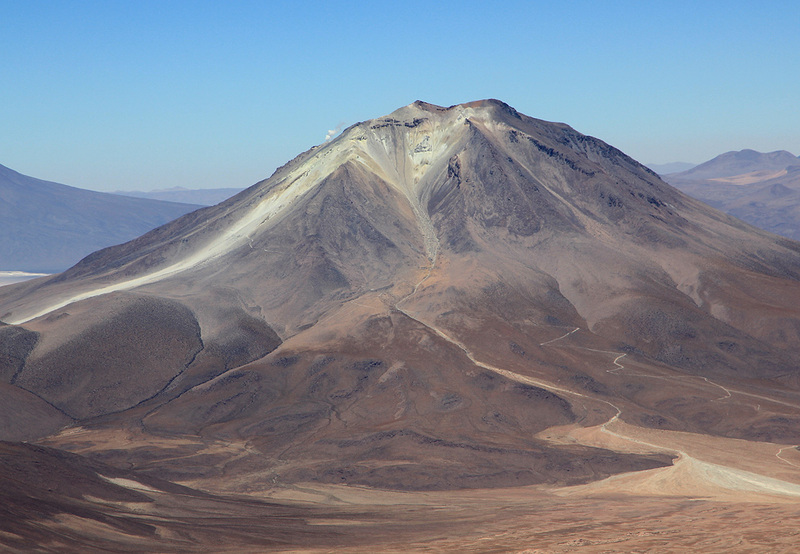 This mountain is located east of the Chile/Bolivia border, east of the better known mountain Cerro Ollague, located near the small border community (border crossing) with the same name. 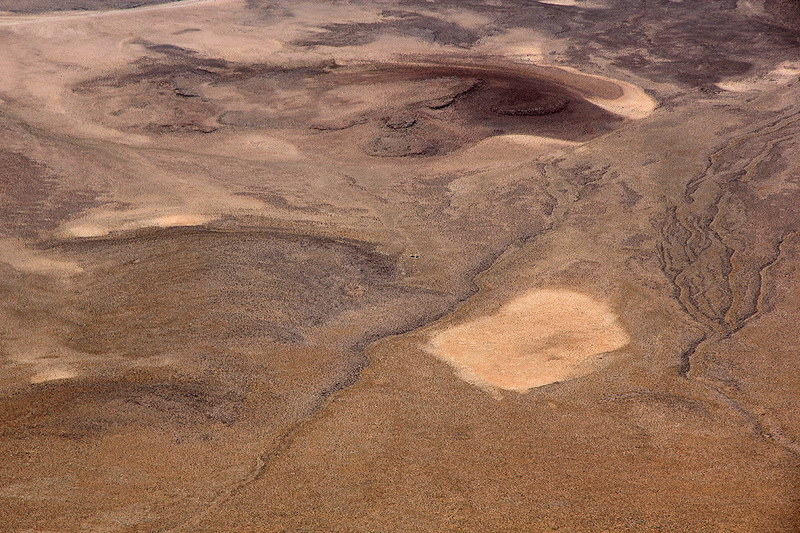 There are several large mountains (all volcanos) in this area. There are many small dirt roads in the area, access from the small town of Ollague is pretty straightforward. Access is best from the north-south dirt road that runs east of Cerros Cañapa, then west of Cerro Tomasamil. Locate a point near location S21.266, W68.023 along this road. With a 4WD it is realtively easy to just leave the road and drive towards the lower slopes of Cerro Tomasamil. We drove to location S21:16.060 W068:00.133, elevation about 4350 meter and established our camp there. From the described trailhead/camp, one should head towards the very long and pretty gentle ridge that forms the left skyline as viewed from camp. Follow this ridge all the way to the summit. The footing is pretty good all the way. 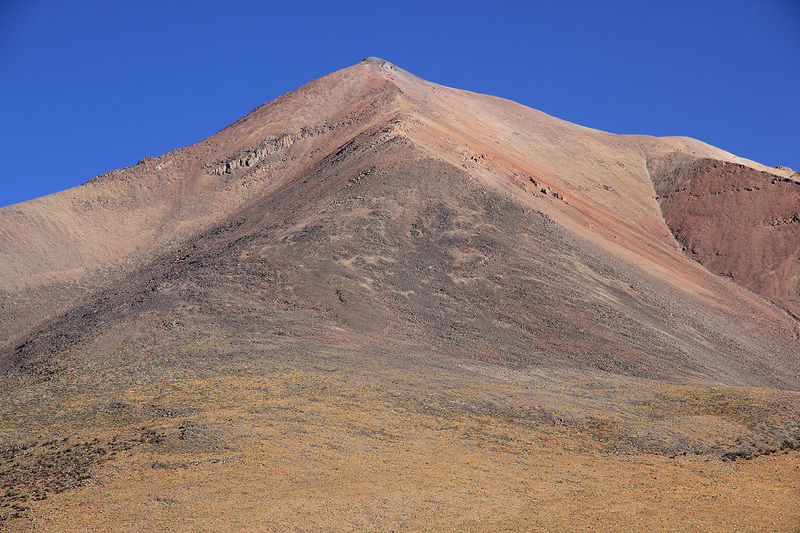 Higher up, what appears to be the summit, is a false summit. The last part of the ascent follows a fairly gentle ridge that eventually tops out at the summit. This climb would have a pretty large vertical gain, we started shortly after daylight at 0605 and it took us 6 hours including several short rests along the ridge, to the summit. 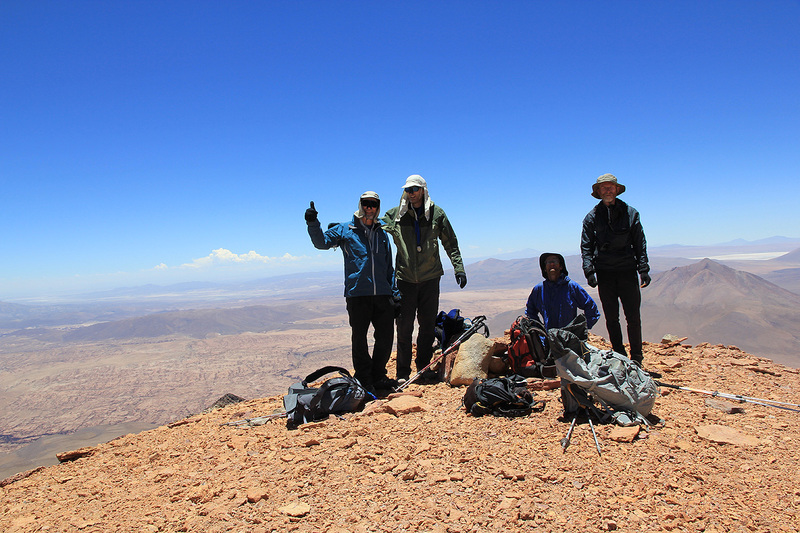 It was nice to see all 6 members of our team making this summit, our last goal in Bolivia. 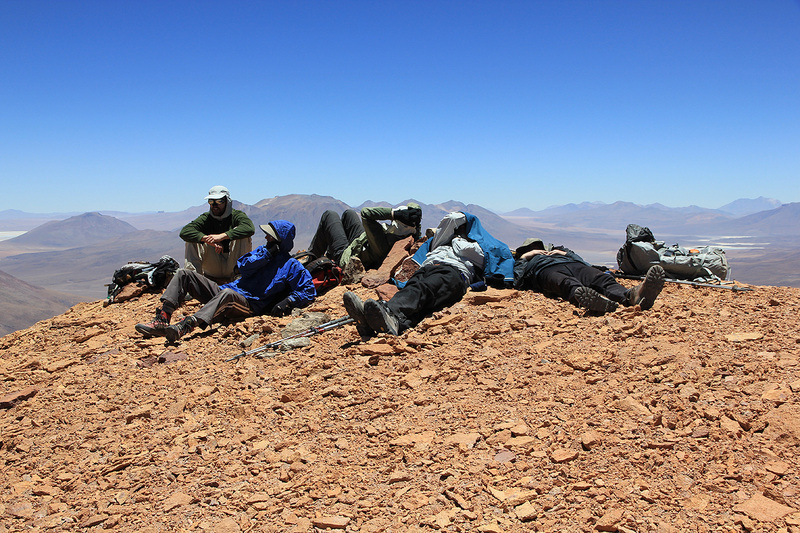 We spent a good 1:15 at the summit, relaxing in the relatively warm and comfortable weather. Leaving at 1320, we again largely descended on loose scree in the bowl next to the ridge. 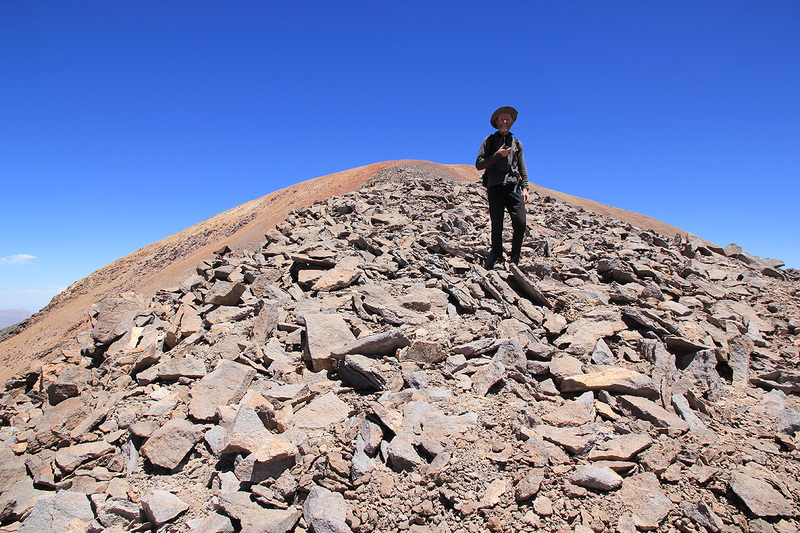 We arrived back at camp by 1630 after a return hike that included multiple rests in the good weather and since acclimatization really favored spending as much time as possible at elevation before our drive into Chile. A summary of peaks climbed are available. A full trip report can also be consulted for more pictures and additional details. View from our base camp I. View from our base camp II. View from our base camp III. Rob on the summit ridge. 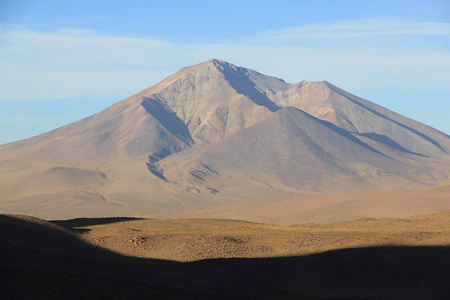 Tomasamil, the ridge that ends in a triangular face (we did not climb this).